This booking was quite straightforward. There weren't too many options to choose from.I briefly romanced the idea of taking a private operator, then was a little confused about the route, and the fare seemed a little high. I even thought to taking a bus to Mantralaya and then another bus from there. However, I finally decided to pick the NEKRTC AC Sleeper service from Raichur to Bengaluru. I was not very confident of the quality of the bus, but decided to try it any ways! I was back at the hotel room a little before evening after my examination work. I spent some time in the room, then had a fairly heavy evening snack. I skipped dinner and headed to the bus station around 1945hrs for a 2004hrs departure. I checked almost all the platforms at the bus station, but the bus was no where to be seen. I hadn't received any message from KSRTC either. The bus arrived at the bus station a little past 2000hrs - about 3 minutes to go for departure. Boarding started just past the departure time. The crew were fast, and completed the boarding process in no time. We started off by 2012hrs - about 8 minutes late. I was on an upper berth - it was a task getting to to the berth, due to the poorly aligned ladder to climb on to the berth. The berth was sufficiently wide - but lacked a pillow! The berth had a small elevation at the head-end, but was hardly sufficient for a pillow. Headroom was a premium, and it was impossible to sit straight on the berth. The AC vent was in full flow, and the vent near the leg was non-closable. The engine noise was well under control, and ride was very matured. The bus, after I got off at Bengaluru..
We stopped near Navodaya Medical College for a pickup (2028hrs). The driver wasn't very fast, but we did have good pace. I was engrossed in watching a movie - the road seemed good, and the ride was quite comfortable. I was badly missing a pillow, and initially made good with the blanket. We got to Mantralaya by 2126hrs. More than half the booked passengers got in here - the boarding process was slow as well. We completed boarding, and got moving by 2139hrs. I was still busy with the movie as the bus exited Mantralaya and entered a two lane road. A quick check at the map showed that we were not on a main road, but looked like a "by-road". The driver was quite fast, and the two lane road meant quite a lot of sways, potholes and uneven surfaces. There was a pick-up en route - the map said we were at Yemmiganur (2204hrs). The driver was quite fast even on the small road. I fell asleep sometime in between. I woke up just as the bus stopped on the road side for some to relieve - the driver was careful not to allow more people. I slowly felt hungry as the bus got moving from there. I was still wondering why the bus wasn't stopping for dinner yet. By now, the lack of a pillow was bothering me quite badly. The berth got really cold, and I had to use the blanket to cover myself. I fell asleep sometime in between. I was quite tired, and somehow overcame the lack of a pillow. I woke up just as the bus pulled in for a break - the time was past 0030hrs, and we were at a Hotel called "Highway Amogh" near Gooty. Quite a lot of buses were already parked around - including a Greenline AC sleeper, an Airavat Club Class from Mantralaya to Mysore and some other random operators. I was quite hungry, and just rushed into the hotel for some food. The service was very lousy, and the sole waiter seemed harried. He brought the wrong orders, and missed taking orders from quite a lot of passengers as well. There weren't too many options, and I just ate whatever I got. The lousy service meant he never took orders for a repeat, and quite a lot of people just walked out without eating anything. I finished my food, paid for my food at the cash counter and remained outside the hotel. I met a colleague who was traveling by Greenline at the hotel. We spent some time talking - his bus was the first to leave. We started off only by 0109hrs. The driver took it really slow, and we were running at speeds in the range of 70kmph on good four lane roads - he was quite fast on the two laned road though. I slept off soon later. I had a fairly long and nice sleep after dinner. 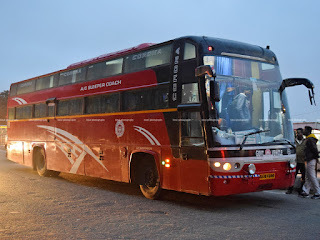 I woke up just at the conductor came around to call for passengers alighting at Hebbal - the bus stopped near a couple of BMTC buses that were going towards Silkboard - a very good move, helping passengers who needed onward connectivity. We moved from Hebbal at 0524hrs. The driver was quite fast after that - we went though Chalukya, then towards Mysore bank circle and finally reached Kempegowda bus station at 0539hrs - about 11 minutes before time. I got off here, while the bus continued to Shantinagar bus station. Summary: The bus, KA-32-F-2010, homed at Raichur-2 depot seemed quite tired and old. The odometer read 1.86 Lakh kilometres - which could be true since it runs only about 450kms each day, and has been on the road since 2015. The bus seemed to be quite well maintained - it had its scars, but did not make unusual noises. The ride quality was complaint to Corona's tagline "choose to float". The independent suspension set up really made the ride comfortable. Being towards the front end of the bus ensured I did not have to endure the screaming engine. My previous experiences with the Corona has been quite good (The first ride being in 2010, and then again in 2015, and 2017), except the sound from the engine towards the rear berths. Both the crew members were soft spoken and very friendly. They were very polite while dealing with passengers and were proactive in helping passengers. The dinner break was a little too late - maybe there aren't good options on the way, but I'd surely recommend people taking this service to have their dinner before they board. Overall a good service. Will I take this service again? Its a great choice. Will give another try for sure.